Store-bought sushi is one of those “easy to grab” lunches that most think of as a “healthy” option. But did you know sushi rice contains sugar? Most sushi fillings also contain some kind of food allergens such as gluten and soy (found in soy sauce, teriyaki sauce, deep fried crumbing), dairy (found in Japanese mayonnaise) and preservatives and sugar (found in marinades). 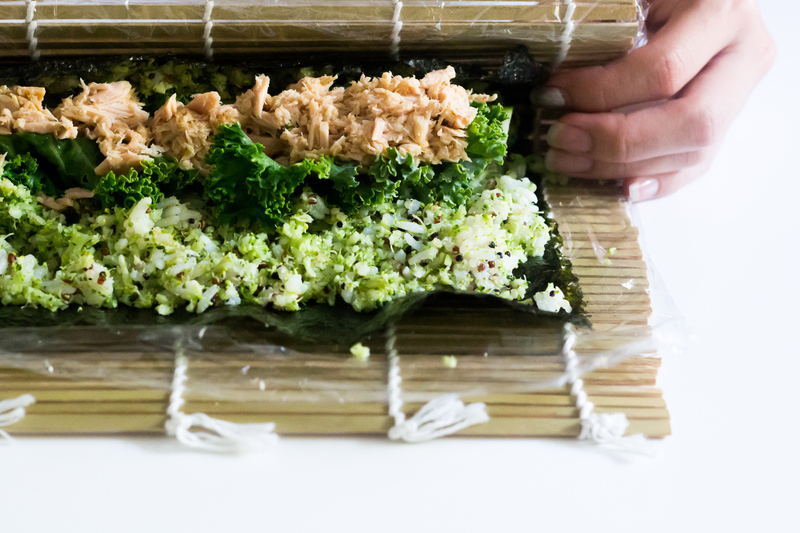 Why not make your own quinoa sushi that is full of fresh and unprocessed ingredients for a simple, nourishing lunch. 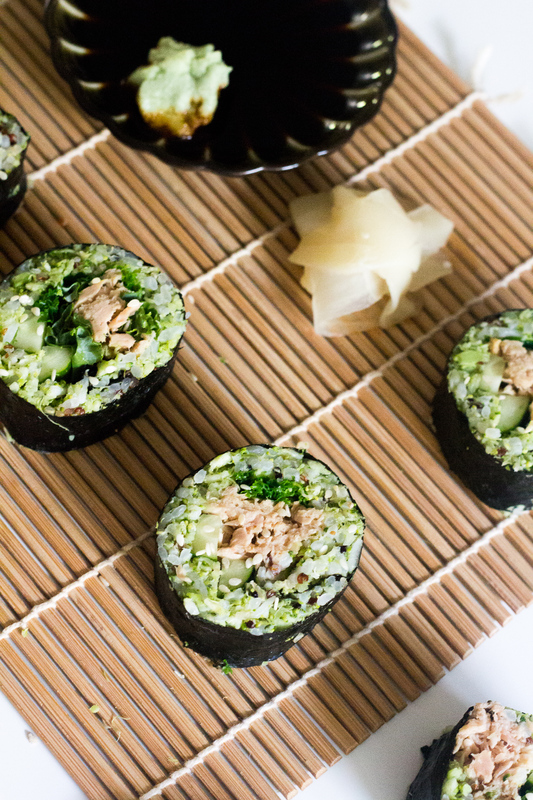 These sushi rolls are a great lunch for at home or to take in a packed lunch. 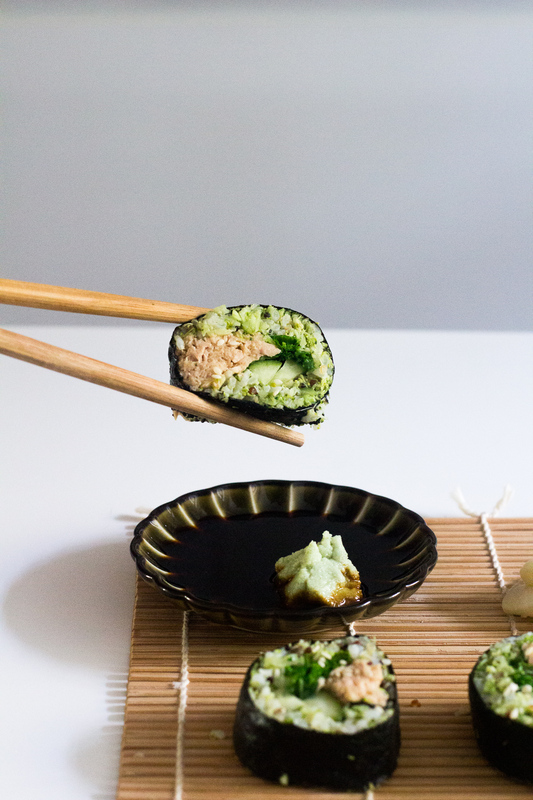 Kids love these sushi rolls too. 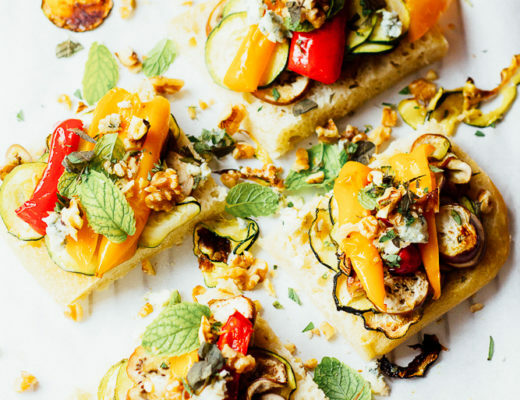 In this recipe, we substitute starchy white rice for high protein quinoa and blended broccoli but you can also make these rolls simply just with protein and vegetables. Quinoa Sushi contains healthy protein, slow-release carbohydrates and fiber providing you with a satisfying and filling lunch or snack. 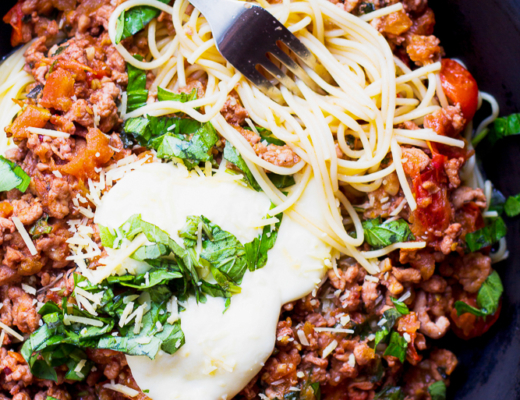 Quinoa is a high protein, gluten-free alternative to rice that provides a healthy source of slow release carbohydrates. 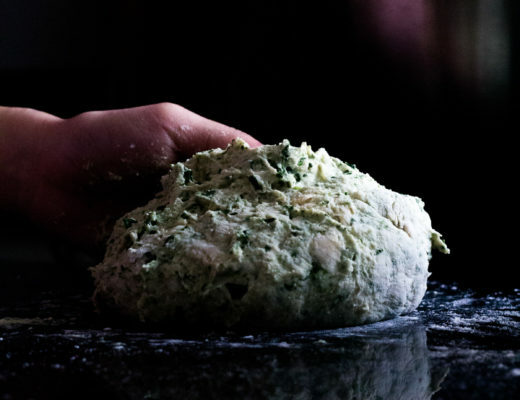 Choosing quality protein options such as cooked fish or canned salmon, tuna or cooked chicken adds extra protein and nutritional content to your rolls. We choose canned tuna in oil. 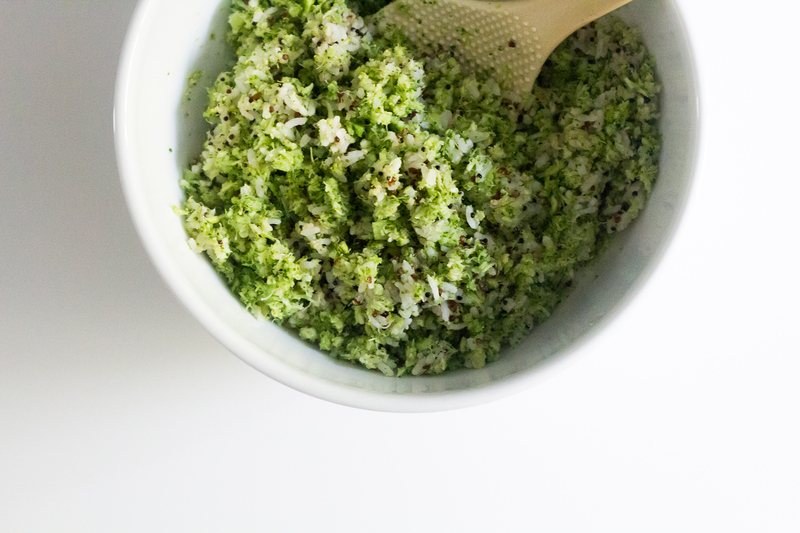 Instead of quinoa, you can use ‘cauliflower/broccoli rice’. To make cauliflower/broccoli rice simply grate cauliflower/broccoli florets and steam or pan fry until just tender. 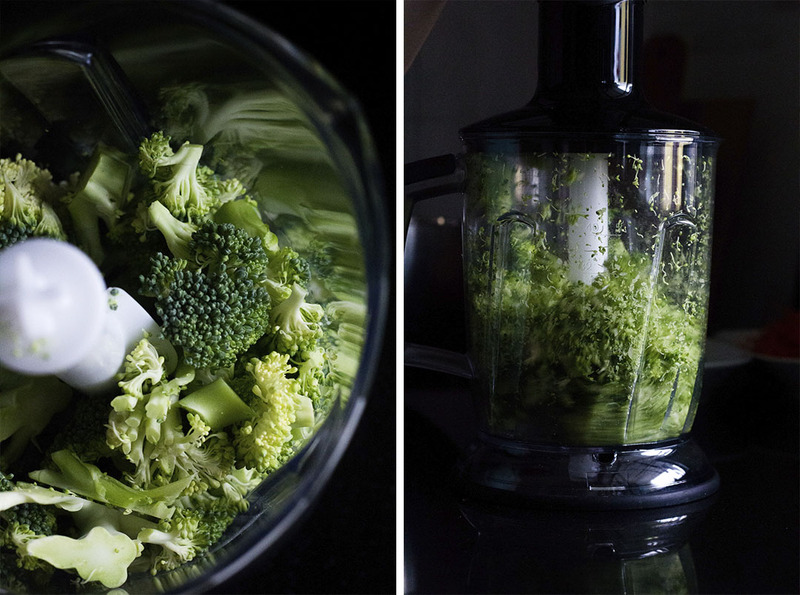 However, instead of choosing just one we combine both together – the broccoli and quinoa. Prepare fillings and set aside. We slice the cucumber and soak in hot water for a minute and dried the kale leaves. 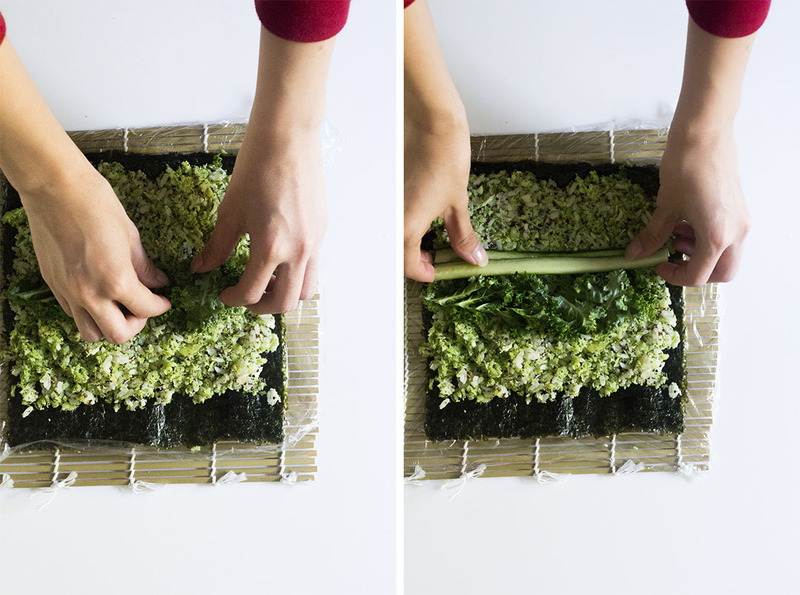 Place nori sheets on a flat surface and run wet fingers along the edge. 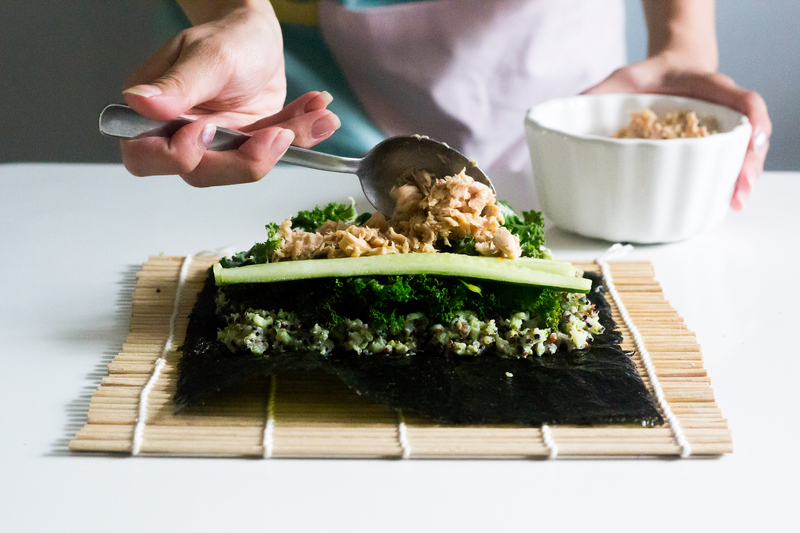 Line one end of the nori sheet with quinoa and broccoli mixture then top with filling (we top it with cucumber, kale, and canned tuna) all the way across one edge. Gently fold filling end over on itself and continue rolling to form a tight cylinder.